Sign up for free and just shop with Thompson and Morgan as normal. Our average member earns over £300 cashback a year. Excludes products in Tool Shed, Outdoor Living, Buildings & Fencing and Wild Birdfood categories. Thompson and Morgan cashback can be earned simply by clicking through to the merchant and shopping as normal. Thompson and Morgan Cashback is available through TopCashback on genuine, tracked transactions completed immediately and wholly online. Cashback cannot be earned on the Tool Shed, Outdoor Living, Buildings & Fencing and Wild Birdfood categories. Watch your money grow when you take up one of our superb Thompson & Morgan voucher code and cashback deals when buying for your garden. 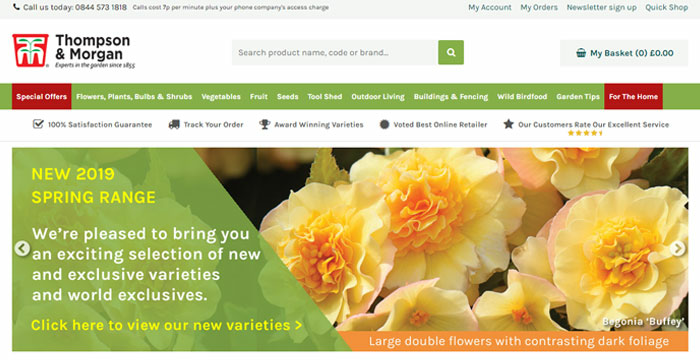 They are one of the UK's largest mail order seed and plant companies, offering the best products to gardeners and enthusiasts through their website and catalogues. Whether you are interested in growing flowers, vegetables or fruit, or are looking for gardening equipment like a hanging basket, their range includes award-winning products. Browse special offers or use their plant finder to search for the ideal products to grow in your garden by specifying criteria such as soil type, height, spread, flowering month, position and foliage colour. You will also find handy gardening information on such subjects as planting bulbs, as well as a price promise. You can use our Thompson & Morgan voucher codes or cashback offers to purchase from an extensive range of products, which includes seeds, bulbs and young plants, as well as seed potatoes, onion and garlic sets and fruit trees. Shop for annual and perennial flower plants, as well as sweet pea seeds and fuchsia plants, while they also sell roses and shrubs. Their collection of vegetable seeds features bean and tomato seeds, while you are also able to purchase herbs and raspberry plants. When it comes to looking after or enjoying your purchases, their gardening range includes essentials like fertilisers and garden furniture. Thompson & Morgan also have their own plant breeding programme, based in Suffolk, which has produced a number of award-winning discoveries. Whether you are thinking of tackling your neglected garden or have been gardening for decades, you can always learn something new. This is why Thompson & Morgan have a section on their website dedicated to providing you with handy 'How to' guides, which will provide you with hints and tips from their experts to help you along the way. If you are looking for advice regarding the right plants for your garden or need help tackling bugs which are eating your plants, you will find articles which tackle a great range of subjects. Should you find plants, bulbs or seeds cheaper in another mail order catalogue, Thompson & Morgan will not match the competitor's price - they will beat it by giving you back TRIPLE the difference. After purchasing, should you notice the exact same variety and pack size being offered in a competitor catalogue at a cheaper price, you will receive Thompson & Morgan vouchers to the value of triple the difference - up to £100 per customer. When making a claim, you will need to provide details of the plant, bulb or seed, including the genus/species, variety, size of plant or bulb, the quantity of plants, bulbs or seeds per pack, the price, the name of the competitor's catalogue and the page number. Their price promise only applies to flowering plants, bulbs and seeds. Orders for packets of seeds will incur a delivery charge of £1.95, while orders which include any other products will be subject to a £4.95 delivery fee. Orders of seeds and gardening equipment will usually be delivered within seven working days, while items such as plants, bulbs and potatoes will arrive with you at the appropriate time for planting, which will be stated on the product page or when you receive acknowledgement of your order. Each different variety of plant is packed separately, so if you order several different plants or products, it is likely that they will arrive on different days. All plants will be delivered with growing guides, which will help you to get the best from your chosen varieties. Plant a seed which will earn you fantastic cashback rewards by taking up one of these great offers. Thompson and Morgan has grown to become one of the UK's largest mail order seed and plant companies. Through their catalogues and website, they are able to provide gardeners with the very best products money can buy. Their product range has expanded to include an award-winning seed range, young plants, bulbs, seed potatoes, onion and garlic sets, soft fruit and fruit trees, as well as an extensive range of gardening supplies.